It looks like most of the yachting industry is going to be in Abu Dhabi over the next few days as I learn that Michael White and Peter Thompson at Ocean Independence will be showing their joint central agency, with Kevin Bonnie at International Yacht Collection, the 39.1m motor yacht Red Sapphire. 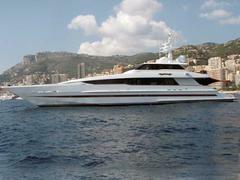 Red Sapphire was built by Heesen in 1999 to ABS class and regularly maintained in immaculate condition. This superyacht's interior, designed by James McFarlane, sleeps 10 guests in a master, two double and two twin staterooms. Red Sapphire is on the market asking $12 million.